Got my wall hanging done for Pat Sloan's Pumpkin Challenge with the Moda Bakeshop using Moda's Gobble Gobble fabric by Sandy Gervais. I used two charm packs and some yardage for the borders. I really liked the way it turned out except that it isn't quilted. 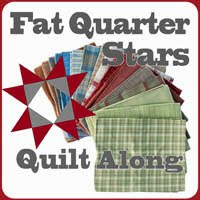 I have the perfect quilt design for this quilt, but my quilt machine is still having trouble. Ughh. Today the tech I was talking to said I should ask Murphy to go away. How do I get a hold of Murphy so we can have this little chat? There's still time for you to enter the challenge if you want. Your original wall hanging doesn't have to be done and picture posted until Nov 10th. It does have to have to 1) use the Gobble Gobble fabric line, 2) use Pat's pumpkin applique shape, and 3) use the hourglass block in it. The details are all over at Moda Bakeshop. 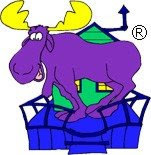 There will be Moda prizes for five winners. I hope they are just choosing winners randomly. It didn't say. Thank goodness for quilt projects. They may not be cheaper than a therapist, but they are so much more satisfying! The hourglass is a fun block that is pretty simple to make, and it looks fabulous. It can be used on it's own or as an alternate block. It works great as an alternate block with both simle and complicated blocks. 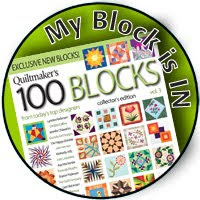 In this tutorial, I show how to make this hourglass block, and I use it as an alternate block with just a plain square. 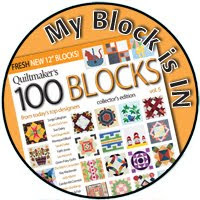 The finished size of this block is 6", but I explain how to make this same quilt with any size block. It's easy. 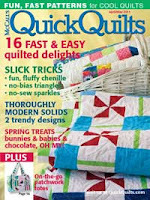 It is also easy to vary the size of the quilt by increasing or decreasing the number of blocks in the quilt. If you make an hourglass quilt, I would love for you to post your pictures on my flickr group that I just set up. P.S. It really bugs me that the quilt isn't quilted. My quilt machine is broken. (Ughh!) I will take a new picture when the quilt is quilted and bound and washed. 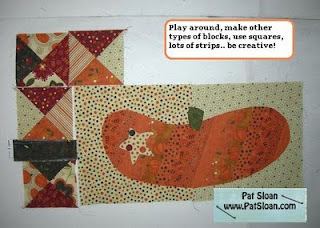 This tutorial was inspired by SewMamaSew's Scrap Buster contest because, "When life gives you scraps, make quilts!" 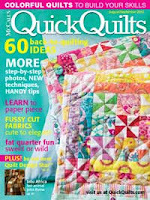 And now. . . . off to make more quilts! I recently read about an organization, Margaret's Hope Chest, that has a goal to provide 400 quilts for homeless children in Michigan. Here is a link to their blog and the information about this specific project. Their deadline is Nov 15th. 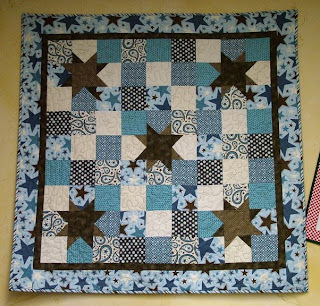 They call this project Hope Squared because they are suggesting you just sew squares together because that makes a fast and easy quilt. They will take other patterns and they will finish it for you! Being a long arm quilter, I despise the thought of just sending a top, but my machine is out of order so I will just be sending a top (and backing and binding and batting if it fits in my box). 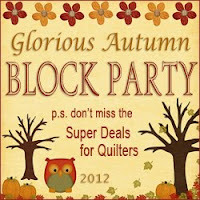 I am continually amazed at what a giving group of people that quilter's are. Helping children really brings out the best in us. I had some leftover material from my bulls eye quilt "Kaffe Fassett Meets the 30s" (see previous post) so I sewed them together with a few skinny white strips for fun and ended up with this cheery quilt. While it is very simple, I really like it. 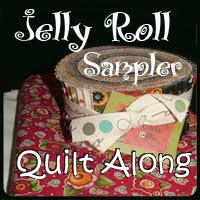 I am hoping to get another quilt made, but I still have that baby coming (hopefully soon) that may not let me get to it. Yesterday was the beginning of our Shop Hop. 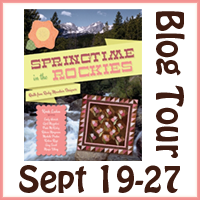 It was fun to go into one of the shops, Cherry Tree Cottage, and see a couple quilts from my books. 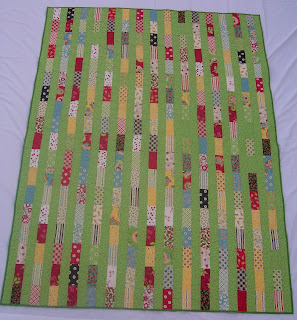 First there was this great quilt from Simply Charming Fun. It is actually a bonus pattern, a variation of Charming Stars. I love it made up in this Riley Blake fabric line, All Star Cottons. Blue and brown are great boy colors! Of course, I love them as well. 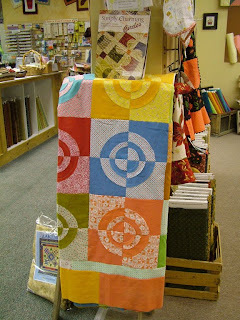 Then there was this quilt from Simply Charming Circles. I actually made this quilt. I wasn't able to get it quilted because my machine is having trouble right now (Ugh!) This is the Bull's Eye pattern. I can't wait to get it quilted and washed! I am going to call it "Kaffe Fassett meets the 30s" just as an inside joke to make me laugh. 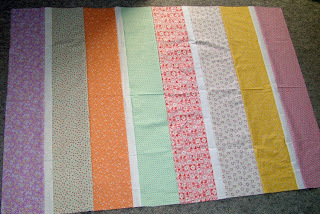 The prints are 30s prints, but the solids are Kaffe Fassett fabrics. While Kaffe Fassett's print fabrics would never be combined with 30s prints, his solids were wonderful. They have a texture to them that gives interest. I loved working with them. 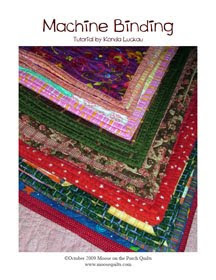 After picking up quilting as a hobby a dozen years ago, binding was one thing that took me a few years to learn. 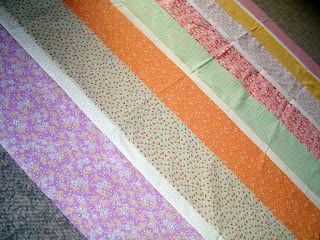 First I put a separate binding strip on each side of the quilt so there were raw edges on the corners. I only did that once. Then I discovered making a separate continuous binding. Corners were still a problem, but at least they were raw edge. Where the beginning and ending of the binding overlapped, I just showed one end underneath, turned the other end under and slip stitched it closed. After someone showed me the corners, my bindings started looking MUCH better, but there was still the beginning and end. 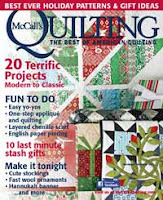 Another kind quilting soul (fortunately there are many kind quilting souls in the world) showed me how to take the quilt out from under the sewing machine and cut the binding just enough longer to finish off the binding with a straight seam. THEN my bindings finally looked good. You couldn't tell where I stopped and started because it looked like every other seam. That was really a good method, but using a diagonal seam works even better. The problem was I had trouble figuring out how long the binding tail at the end should be. I used the Fons & Porter method successfully, but I always had to refer to their "cheat sheet" to remember how to do it. 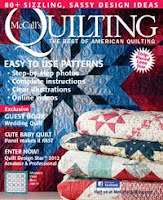 Enter another kind quilting soul -- she showed me this method. . . . I have seen it in a few places now. 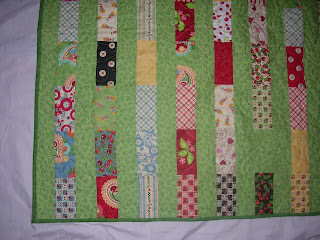 It is my all time favorite way to bind a quilt. That was the long way to say "Here is a free tutorial on Machine Binding. Enjoy!" Okay, so I love Pat Sloan. I have actually met her at Quilt Market. 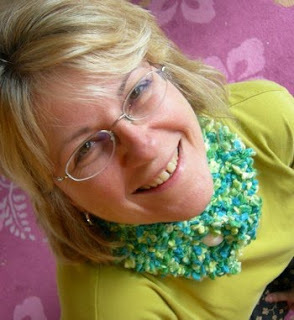 She is a fabric designer for P&B Textiles and a great pattern designer. She is one of those people that you would swear is always smiling and cheerful and friendly. 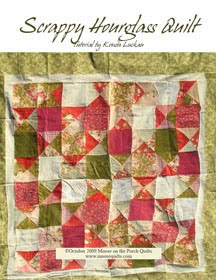 I love how she combines bright fun fabric with folk art type, whimsical designs. She is always doing one fun challenge or another. I am usually not inclined to sign up because I worry that I will get half way through and not finish. 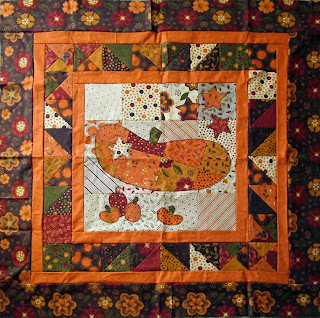 Then I read about her "Pumpkin Challenge" at the Moda Bakeshop with "Gobble Gobble" fabric. 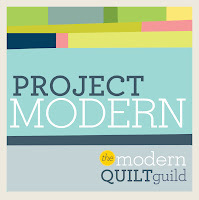 I was intrigued initially because Pat Sloan of P&B Textiles is working with Moda fabric! 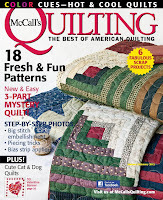 Isn't the quilting community great! 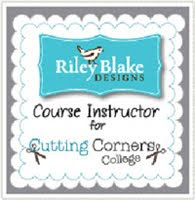 Then she was working with pre-cuts so now I'm thinking about it. That "thinking about it" stage didn't last very long. I love the folk art pumpkin, and it just has to be wall hanging size. I signed up Saturday night, dreamt about my wallhanging Saturday night, and drew it out and figured out yardage Sunday morning. Now it is Monday morning, and I am off right now to buy the fabric. Don't I have anything better to do? Of course! I recently decided that I do some of my best work when I have something better to do! Here is the pattern Charming Stripes from the new book, Simply Charming Fun. 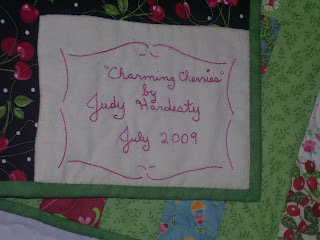 This quilt was made by one of my pattern testers, Judy Hardesty. Judy used the charm pack "Recipe for Friendship" charm pack by Mary Engelbreit for Moda. I absolutely love it! 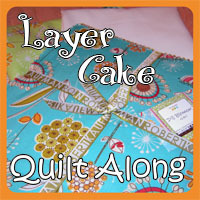 It is great to see how different fabric changes the tone of a quilt. The green background fabric really sets off all those bright colors.